We were always planning to come to Sri Lanka, just not quite yet. It was supposed to be a sojourn from our planned 6 months in India. And we were supposed to apply for the Indian visa while we were in Bangkok, Thailand. Then, everything we read about applying there said that we’d only get 3 months. How am I supposed to see the entire country in just 3 months? And have a month long stopover in Sri Lanka. So we’re here in Sri Lanka now about a month early. Speficially to apply for an Indian visa. Sri Lanka’s visa was easy. 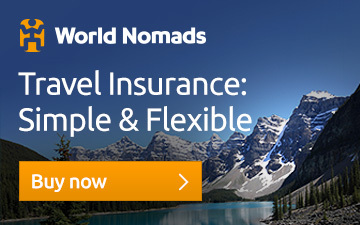 An online electronic travel authorisation that cost us both US$30 each. And then to travel to the Northern Province a permission requirement from the Ministry of Defence and Urban Development (now that’s a weird combo of government departments if I ever saw one..). The Indian visa application is actually EASY. Here’s what you need to do. 1. You must fill in the online form first of all. There are four/five pages to this form and here’s all the information that you will need to complete it – as its one of those forms that you MUST complete every field before you can move to the next page. 2. Your online form WILL save and you can exit and go back to it, but you must complete EVERYTHING on the page for that content to save, so either complete the full page or don’t bother. Details of where your parents were born (town and country). Present occupation (note, if unemployed, then you must detail your previous employer details, right there in the employer field). Likely exit port to India (note that for entry and exit, when you are applying for a double or multiple entry visa, the IVS team say you must put “ALL PORTS” on these last two fields). There is also a section asking if you’ve ever visited India and asking for the details of your previous visa. If you don’t have this information with you, you have to answer “no” on the online form, and then scribble “yes” when you print the form. You’ll need to provide an accompanying letter detailing why you don’t have the visa details and providing as much information as possible attention the Assistant High Commissioner. 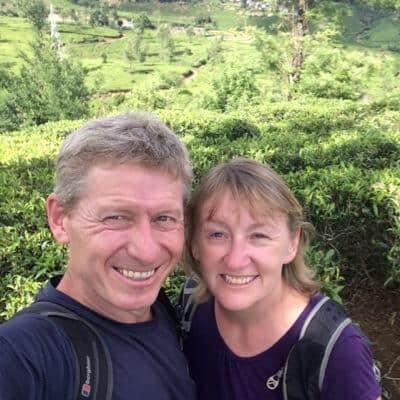 I had the above problem – my old India business visa was several passports ago and I have no idea where it is, so I just wrote a short letter, detailing when I visited India, where I applied for the visa and who my employer was at the time. (I typed the letter, saved it to PDF and have the folks at the little print shop near the IVS office – see below – print if off for me. If you don’t have access to a computer, they will type if for you from a handwritten scrawl and even provide paper for you to scrawl on). There’s also a section asking which SAARC countries you have visited in the last 3 years and how many times (there’s a drop down to assist with this). Then you need to add in “reference for both Sri Lanka and for India. 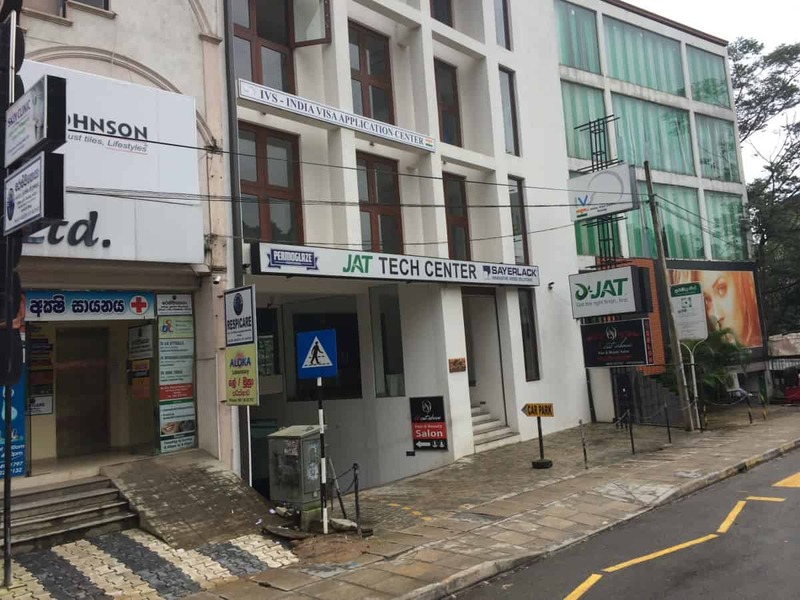 This is simply the hotel details of where you are staying in Sri Lanka and where you may be staying in India. We just put the name of where we were staying that night. Actually completing the form doesn’t take very long at all (around 30 minutes to type it, check it and PDF it.). I started the form completion for two people at 0700, and we were printing it by 0900, having made it from the centre of Kandy and to IVS offices (plus got a shower and dressed as well) in the meantime! At the end of the form completion, you’ll be asked to upload a photo – note that you do not need to do this – if you don’t you simply provide three passport photos rather than two when you hand in your form. Check your info, PDF your form, save it to a thumb drive and then select an appointment from the drop down. This will give you two date options. They were two days into the future, but we just went straight into the offices there and then and there was no problem. There is no one checking THAT date on your form. Now you need to print your form, get a photocopy of your passport, the Sri Lankan entry stamp. You will also need two (or three if you didn’t upload one to the system) photos that must be 2 inches x 2 inches. Printing and copies there will cost you 10 LKR each. Photos are 230LKR for 2 and 50 LKR for each additional one. If it turns out that you’ve made mistakes on your form and it needs amending, then you can bring your details in there and they will redo/ re input it for you for 350 LKR for a non Sri Lankan passport holder. You can also get photos inside the IVS office (450 LKR for four) and photo copies (10 rupees each), but they don’t do printing. 3. There is an additional form that must be completed if you are not a Sri Lankan national. This is called the fax reference form. This is required for all foreign passports – they basically fax it off to the Indian embassy or high commission wherever your home is and there’s an extra charge for them to do this of 350 LKR. 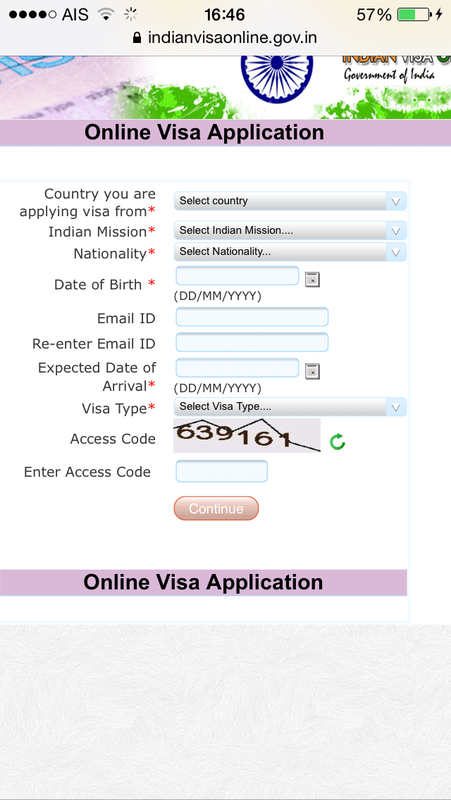 The IVS agency that run the visa system for the Indian High Commission have a copy of the form on their website, but it is out of date. They will give you a copy of the form at the IVS offices, so just complete it there. (take a black pen with you) It is just a copy of information that you have already filled in on the online form. If it turns out that you need two of them (like we did), then you need to pay 10 LKR to get hold of an additional form, which is just exactly the same. And another 350 LKR to process the second form. Fees for the visa itself depend on your country. We paid in cash. We needed the second form because we had been living in the USA for four years prior to traveling, so I guess the folks at the Indian Embassy in the USA need to check that we weren’t being bad while we were there! (Oh and if you need this second copy of the form, you will need an additional photo for that as well). 4. You need a black pen to complete forms and don’t forget to write it in capitals. Despite it all sounding long winded and a chore it was very simple and the guy on the information desk at the IVS office as well as the folks in the little printing shack were extremely friendly and very efficient. (there is a bakery there too, where you can get food and drinks). 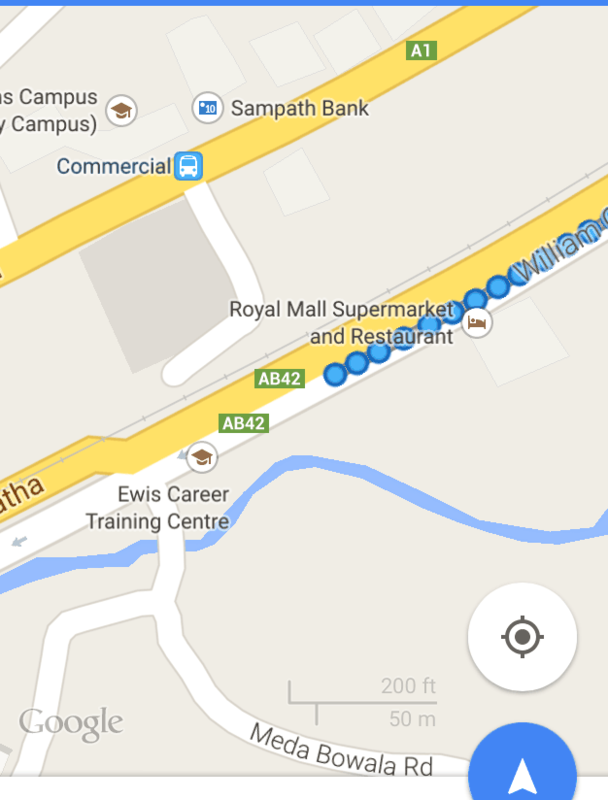 The offices in Kandy are at 675 William Gopallawa Mawatha – this is NOT where Google puts it. It’s ctually here in the screen shot. It’s a further 1km further out of town (she said dripping sweat and glowing with too much sun) – your nearest tuk tuk reference point is the Royal Mall. (cost us 200 LKR to get back from there to near the Trinity College area). Finally when we submitted our applications we were given our passports back. Yep. Now we have to turn up not earlier than 6 working days from now at 9am and submit our passports. They keep them for the day, and you return for them at 430pm. That’s pretty good, because the Indian visa is valid from the date of issue, not the date of entry. So if we only end up with 3 months, we want to lose as little time as possible, but we don’t want to leave Sri Lanka early. You don’t have to return on the day that they say. 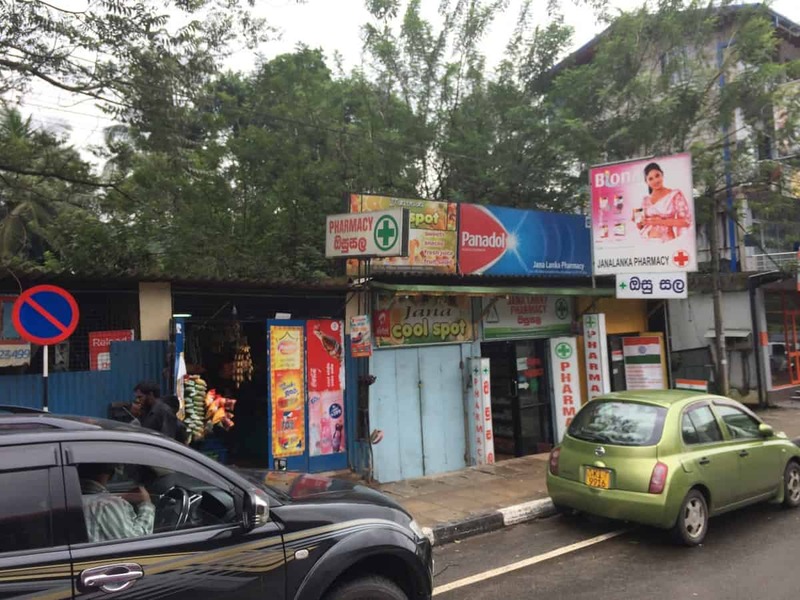 So, if like us, you’re traveling around Sri Lanka, you can drop off your forms early in the trip and return a couple of days before you want to leave the country, hand over your passport, hang around Kandy for the day, pick it up and then leave. We arrived back in Kandy and dropped our passports in on December 29th…spent the day cowering from the incessant rain and then arrived back at the 4pm deadline, to sit and wait for another two hours. And then, HURRAY! We have a double entry SIX month tourist visa to India. Now if only the bloody Internet would work long enough to book a flight to get there!! Hallo there. We’re British and did this in December 2014. Hi. Joachim. Did you succeed in gettingyour Visa? Colombo od Kandy? Thank you very much, as I plan to visit Sri Lanka soon. I had the same sense of “Phew!” as you, when there was relatively easy information to fill out. I doubt many people would understand immediately that your “reference” is where you stayed last night! Thanks Oscar! Enjoy Sri Lanka! This is a very informative blog and provides all the information needed when applying for an Indian Visa! I have never visited Sri Lanka however have always wanted to go!